Treasure Oak finish on select hardwoods and ash veneers. Olive ash raised burl is rubbed to highlight the swirls on the multi-stepped arched bonnet. Full side crown returns. The dial features raised cast corner spandrels and center design against a dark brown hue. Raised Arabic numerals are featured with a functioning moon dial. 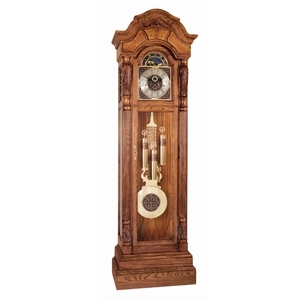 A large lyre pendulum with twisted rods and 10 7/8” (275mm) bob with a raised ornate center design and banded weight shells, beveled glass on the lower locking door and beveled sides.